Castlebar - County Mayo - Mayo Women for Europe! 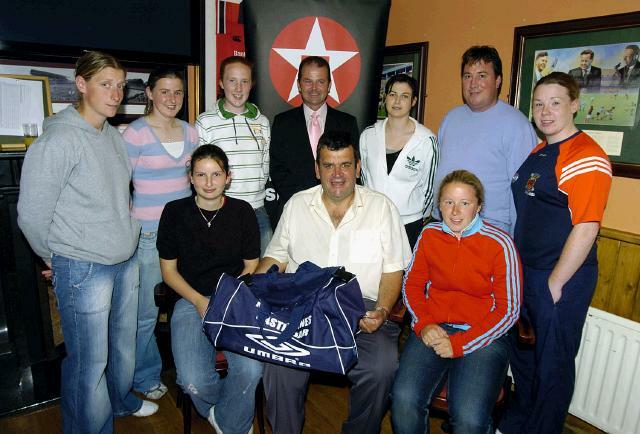 On the 2nd of December 2006 the Mayo Senior Women’s Soccer team made history when they captured the Irish Senior cup by defeating a highly fancied UCD side in Richmond Park, in Dublin. By becoming champions the Mayo team qualified to represent Ireland in the 2007 UEFA cup in August of this year. Pictured in Mick Byrnes Bar Bridge St Castlebar Catherine Jennings Mayo Women’s Association and Jeremy Dee Secretary Mayo Women’s Association presenting a jersey to Emma Mullin who will be representing Ireland in the Student Games and will not be in Austria for the UEFA Cup. 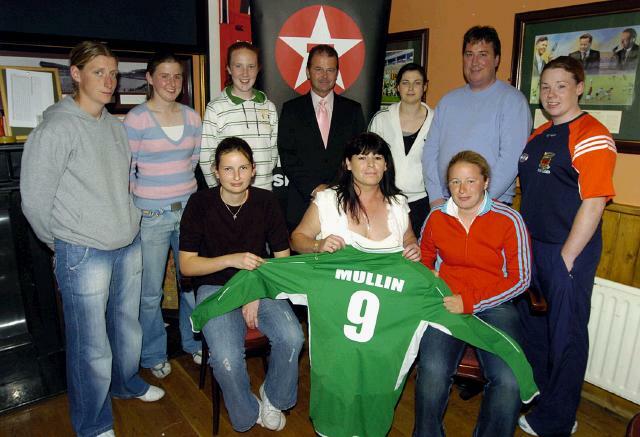 Front L-R: Fiona McLoughlin, Catherine Jennings , Emma Mullin, Back l-R: Cora Staunton, Katie Walsh, Anne Moran, Jeremy Dee, Michelle Ruane, Michael Jennings, Yvonne Byrne Photo © Ken Wright Photography 2007. They also get to defend the trophy and kick off the defence in Limerick on Sunday 22nd of July against the Limerick league at 3pm. 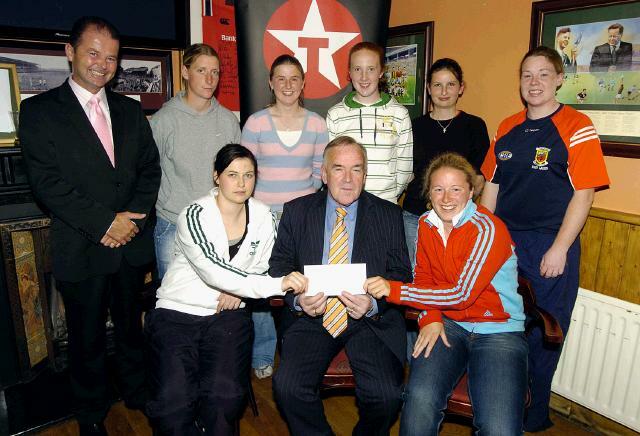 Pictured in Mick Byrnes Bar Bridge St Castlebar Pat Quigley Chairman Mayo League Association presenting a sponsorship cheque to the Mayo Women’s Association for their trip to Austria in the UEFA Cup Front L-R Michelle Ruane, Pat Quigley, Emma Mullin, Back l-R: Jeremy Dee, Cora Staunton, Katie Walsh, Anne Moran, Fiona McLoughlin,Yvonne Byrne Photo © Ken Wright Photography 2007. The 2007 UEFA Cup Competition Qualifying round is been held in Austria from August 9th to the 15th in Neulengbach near Vienna. Match days are the 9th, the 11th and the 14th of August. The only burden on the Mayo Women’s Association is a financial one, and on that note the team would like to thank Michael Byrne for coming on board and sponsoring kit bags for the Mayo panel. 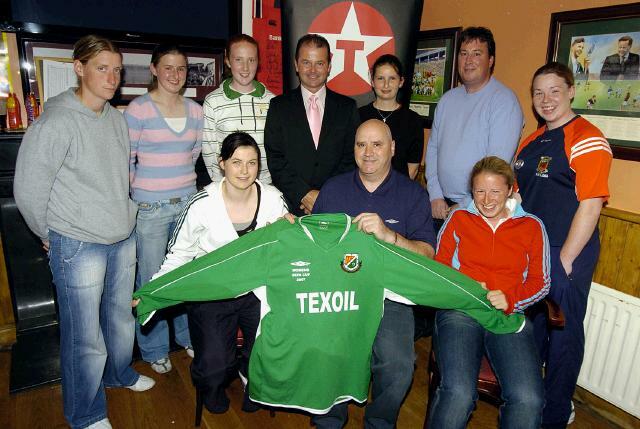 Pictured in Mick Byrnes Bar Bridge St Castlebar Members of the Mayo ladies soccer team with Dave Breen Secretary Mayo Schoolboys/Schoolgirls and Youths Association and Jeremy Dee Secretary Mayo Women’s Association at a presentation of new kit sponsored by Texoil. Front l-R: Michelle Ruane, Dave Breen, Emma Mullin, Back l-R: Cora Staunton, Katie Walsh, Anne Moran, Jeremy Dee, Fiona McLoughlin, Michael Jennings, Yvonne Byrne Photo © Ken Wright Photography 2007. Michael joins our main sponsor, Texoil, as a contributor to the cost of financing our defence of the Senior cup and our trip to Europe. Womens soccer within Mayo in its present format is still in its infancy, only some 7 years on the go, but already we hold the highest accolade in the Country, The Senior Cup. With the help of people like Michael Byrne we can continue to reach higher levels, and we intend to start that climb next Sunday in Limerick. The Mayo Association Football League, The Mayo Schoolboys/Schoolgirls & Youths Association, The Connacht Schoolgirls Association, UEFA and the FAI, are also to be thanked for their assistance to date in promoting Women’s soccer within Mayo. Mayo team qualified to represent Ireland in the 2007 UEFA cup in August of this year. For updates on all womens soccer in Mayo you should visit www.mayowomenssoccer.com where you will find fixtures, results, team news, and links to our sponsors. If any individual or business would like to be involved in this success story you should contact Jeremy on 087 3154974 or Michael on 0861719449.